A question that is often asked regarding films and their ratings is whether it all was better in the past or whether more is possible in comparison to older times. But it is rarely a linear evolution, it rather has waves, trends and events that influence that equation. For example, many films from the 70's and 80's were rated PG but still had more violence than PG-13 movies from the 90's. And in recent years, that rating didn't necessarily mean that the films had to be harmless. Maybe not in terms of visible blood and guts, but regarding the topics one can conclude that a lot of today's PG-13 films would have been "R" back in the day. A film that fits into that discussion is Poltergeist, a Sam Raimi-produced remake and sort-of continuation of the Poltergeist from 1982 that was produced by Steven Spielberg. The latter received an "R" rating in the beginning but Spielberg intervened and it was reduced to a "PG" (note that the PG-13 didn't exist back then!). The film features some graphic scenes that would probably be too much for a PG-13 nowadays, e.g. 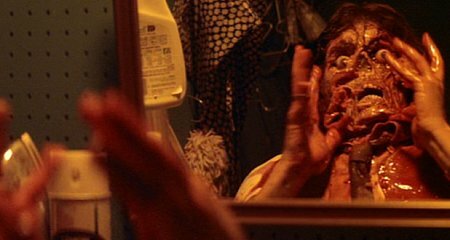 a scene in which a man scratches pieces of skin off his face. It's unclear whether that scene will be a part of the remake in some variant but filmmakers usually don't want to miss out on famous scenes of the original films when they remake them. Just think of Total Recall and its three-breasted prostitute. Poltergeist is scheduled for a US theatrical release on July 24th, 2015.